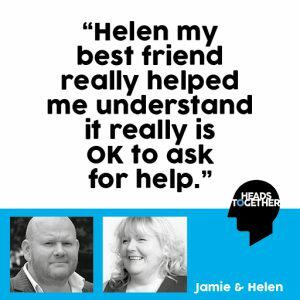 My name is Jamie and when I lost my wife, Helen my best friend showed me it really is OK to ask for help. When my wife Nic was just 35, she was diagnosed with cancer. I nursed Nic for just over four months, watched the cancer slowly take her. I’d gone from running my own business to being a full-time carer, and both dad and mum to our son. After her death, I was drowning. I lost my business, our family home and my self-respect. The past seven years have seen me suffer from a wide-ranging catalogue of mental health problems: depression, anxiety, insomnia and lack of confidence. In times of trouble, it’s easy to feel that there is a “correct way” of dealing with it – pulling on big boy pants and just getting on with it. I was fine, thank you very much, no really. But with Helen’s support I recognised I was at crisis point. I felt like I was at my worst, but Helen wouldn’t let me push her away. No matter what, she was there to support me, understanding what I felt, telling me we would get through it together. Emotional support, friendship and a shoulder to cry on as my world turns upside down? Yes please. In fact Helen and I have now created a social enterprise to help others in a similar situation. We launched a campaign this year called “not waving”, raising awareness to say that it really is OK to ask for help – don’t wait until you’re drowning.